fresh and organic aromatic herbs, ready for a taste ? 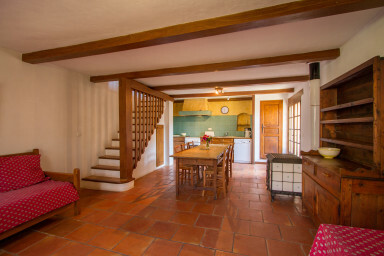 With its 75 m2 and its two big terraces facing south and west, L'Oubradou is one of the biggest gites at Jardin de Vies. The ground floor is one huge living room with a lounge area, a wood burning stove and a fully equipped kitchen. Its two doors enable you to choose which of the two terraces suit you best for eating, reading or taking a little nap, depending on the time of the day and the position of the sun. Upstairs, you will find: a large bedroom with a double and a single bed. A bathroom with a shower and and independent toilet are also at the first level. You will love the space you get at l'Oubradou !